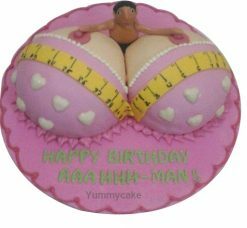 Classy and elegant birthday cakes for adults are perfect for adult birthday parties or bachelor parties. From plain chocolate to fruit-and-cookie topped, our sophisticated birthday cakes for adults are delicious and mouth-watering. Call 9718108300 to book yours. Terms and Conditions remaining are the same for all orders. Call us on 9718108300 for quick orders of Birthday Cakes For Adults. Wow! what a cake. Ordered this cake for my friend to celebrate the bachelor party and the message on the cake was “Now No More Masturbation”. Thanks a lot Yummycake.